What are the rules for storing coffee? When coffee is roasted, it’s packed into the sealable, light proof bags that you see on the shelves at Relish. One important feature of all these bags is a little plastic one-way valve that the supermarkets call aroma valves. Whilst you can squeeze the bag and smell the coffee, they serve a much more important purpose. 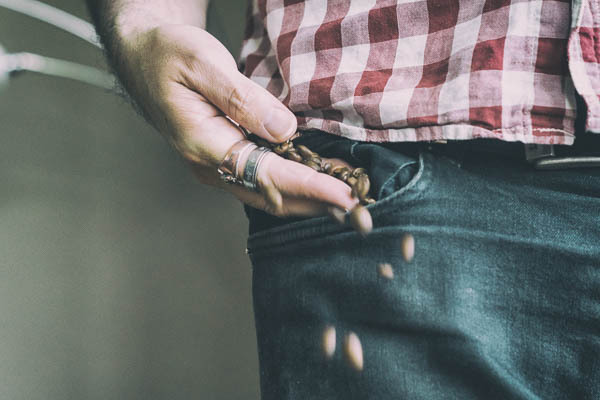 When beans come out of a coffee roaster they are packed with carbon dioxide gas trapped within the cellulose structure, this is natural and a result of the roasting process, . This gas slowly leaks out of the beans over the first few days and without the valve, the bag would gently inflate but ultimately explode. Beans in a sealed bag are in a dry, stable atmosphere of pure CO2, this helps keep them fresh. Once opened, you introduce moisture and oxygen which accelerates the staling process. Once ground, the massive increase in surface area exposed to moisture and oxygen results in rapid staling and within minutes, your coffee loses a little of it’s magic. So the first rule is keep the beans as beans! At Relish we like to use and sell coffee that’s less than a month old (from roast), but dependent on the roast process, some coffee last upto 3 months in good condition. Past then, your coffee starts to taste noticeably stale. Dull, flat, a little bit like cooked cardboard, with none of the delicious aromas that make speciality coffees so worth the extra pennies. So, how do you keep coffee as fresh as possible for as long as possible? The enemies of coffee are moisture, sunlight and time. Handily the same enemies of biscuits; so little and often, fresh and whole bean. Keep in an airtight container, away from light and moisture. Most good coffee bags are resealable, but a good kilner type jar works well, just keep it clean. If you're buying your coffee ground, don't. You need to buy a grinder. It doesn’t have be expensive and will usually last for years. However, there are different types of grinder that I talk about on the Brew course, don’t just go for the cheapest or the one that matches your food processor! Oh, and what mustn’t you do? Keep your coffee in the fridge or freezer. Ever.